(L-R): Coach Dwight Smith, silver medalist Isaac Herbst, gold medalist Nicholas Lawson, Coach Sergey Danilov and top-eight finisher Skyler Liverant. Photo Credit: Sergey Danilov. 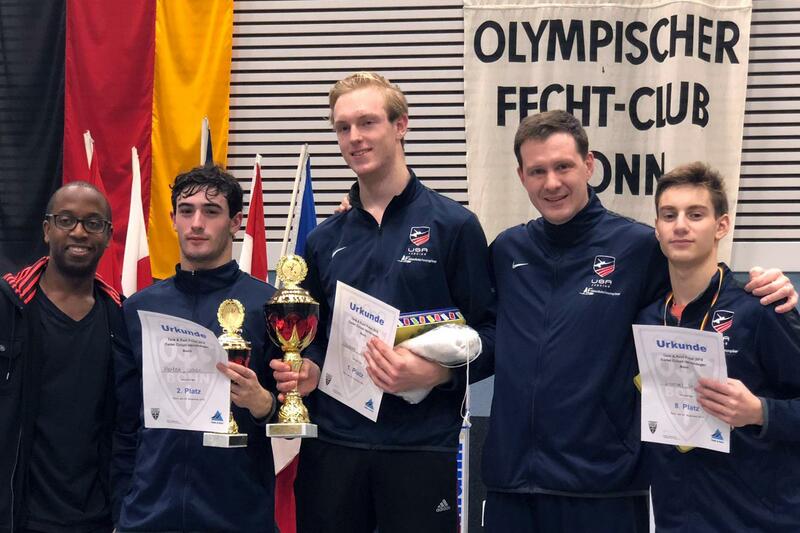 (Colorado Springs, Colo.) – Podium finishes at Cadet European Cups have become the norm for Nicholas Lawson (New York, N.Y.) and Isaac Herbst (Houston, Texas) as the two Americans won gold and silver in Bonn this past Saturday. Lawson has now medaled at two of his last three Cadet European Cups, winning his first gold in Germany over the weekend. 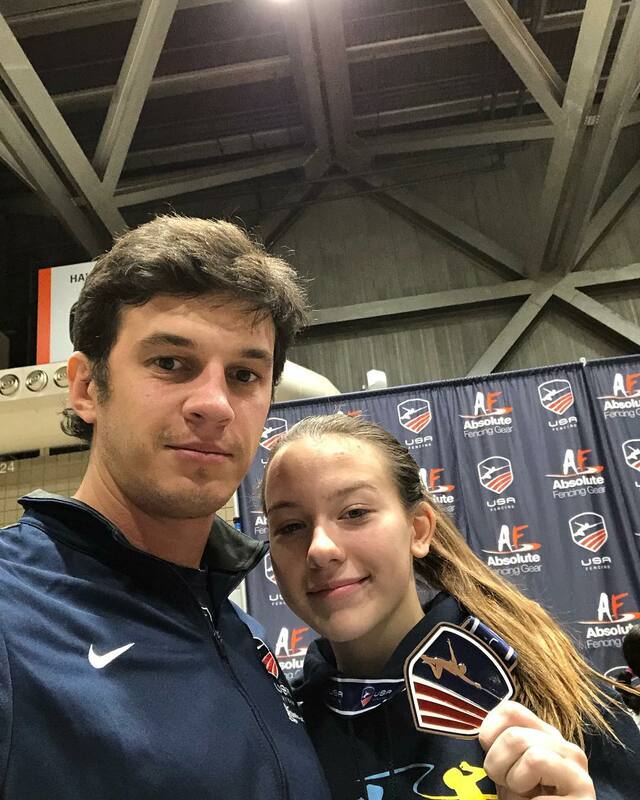 Herbst, a 2018 Youth Olympic team bronze medalist, had finished on the podium at the last four Cadet European Cups he’s attended dating back to November of 2017. The final between the Americans would be their second matchup this month as Herbst defeated Lawson 15-11 in the semifinals at the November North American Cup. This time it would be Lawson’s turn to come out on top, but only by a point as the match for gold went down to the final touch, 15-14, in Lawson’s favor. Both Lawson and Herbst went 5-1 in pools before holding their table of 128 opponent to single digits as Lawson overcame teammate Colin Neibergall (Lone Tree, Colo.), 15-8, and Herbst bested Alexander Ebnoether (SUI), 15-5. After edging out Fabio Murru (GER), 15-12, in the table of 64, Lawson defeated teammate Stafford Moosekian (Los Angeles, Calif.), 15-10, and Iino Heurlin-Vazquez (FRA), 15-6. A 15-8 victory in the quarter-finals over Niels Roubailo (NED), and a 15-11 win against Matteo Wicht (SUI) guaranteed Lawson a spot in the gold medal final. Herbst controlled his first two bouts against Tobias Schulz (GER) and Pierreck Rousseau (FRA) by scores of 15-8 and 15-9, respectively. With a 15-10 victory over Allan Diane (FRA) in the 16, Herbst advanced to the quarters, where he faced Diane’s teammate, Paul Fortin (FRA). Herbst continued to cruise, guaranteeing a medal with a 15-8 victory over Fortin and earning the opportunity to fence for gold with a 15-5 win against Jonathan Fuhrimann (SUI). Herbst and Lawson currently rank No. 1 and 2 in the Cadet European Fencing Standings. Competing at just his second Cadet European Cup, fourteen-year-old Skyler Liverant (Brooklyn, N.Y.) claimed his first top-eight result. Liverant picked up quick victories against two Frenchmen in this first two bouts, outscoring Tristan Turakiewicz, 15-6, and Vincent Macarez, 15-7. Following a 15-12 victory over teammate Daniel Gaidar (Staten Island, N.Y.) in the 32, Liverant advanced to the 16 for the first time in his career and held off Theo Brochard (SUI), 15-11. However, Liverant came up one win short of a medal, falling to Fuhrimann, 15-12. 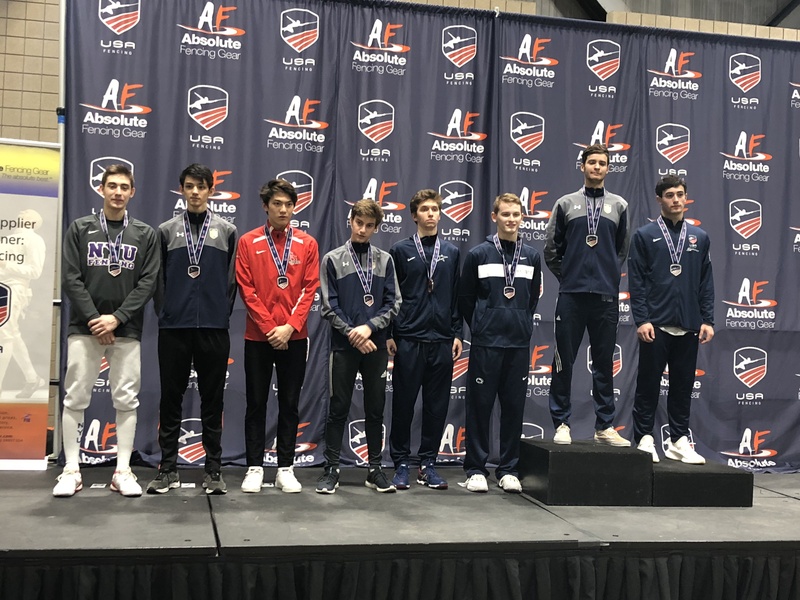 In the newly released USA Fencing Men’s Epee Cadet Team Point Standings, Herbst has a strong grasp on first place with more than a 2,000 point lead over Liverant as he seeks to qualify for a second Cadet World Team in 2019. Lawson ranks third, holding a slim lead of less than 100 points over Moosekian. In the team event on Sunday, USA 2 came within one point of a medal, finishing fourth. The United States had five teams competing in Bonn with two earning top-eight results and two taking top-16 finishes. Represented by Liverant, Mossekian, Michael Mun (Tustin, Calif.) and Ethan Nguyen (Las Vegas, Nev.), Team USA went 4-1 on the day after entering as the 12th seed. Despite dropping the first bout to Germany 3 in the table of 32, the Americans won or tied the next five to create enough of a cushion and go on to win, 39-32. In the 16, USA 2 blazed past Poland 4, 45-27, only dropping one bout throughout the match. The United States earned a come-from-behind victory over Germany in the quarter-finals. Down 16-13 after four rounds, USA 2 won or tied the next four, including 13-5 victory in the eighth, to secure a 45-36 win and a place in the medal rounds. Continuing its momentum, the U.S. squad went up 14-9 after the first three bouts, but couldn’t hold on against Poland 1, falling, 45-33. In the bronze medal match, USA 2 once again built a lead after three rounds at 15-11, but Switzerland 1 responded the following bout to take a one-point lead at 19-18. The Americans took control in the next four rounds to take a three-point lead into the final bout, but Switzerland finished strong to secure a medal, 45-44. The red ribbon is cut at the newly opened New York Fencing Academy. 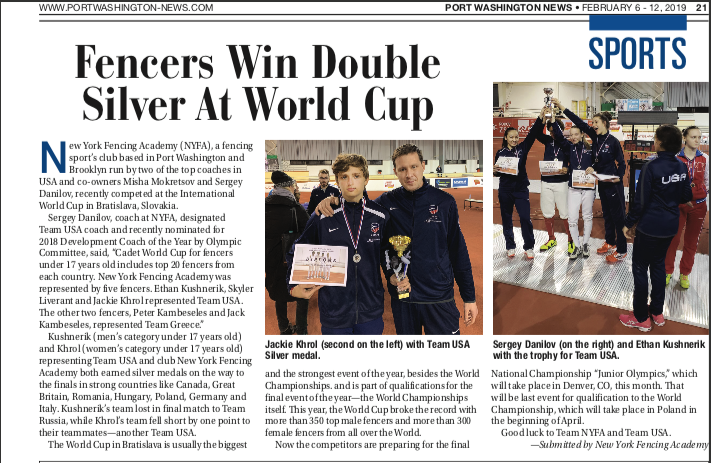 The Port Washington Chamber of Commerce welcomed New York Fencing Academy, the number one ranked fencing club in youth épée by National Fencing Club Rankings, to the town with a grand opening and ribbon-cutting ceremony. The fencing club’s second location on Haven Avenue, with its first in Brooklyn, was opened to offer its successful training programs for ages six and up to the Long Island fencing community. New York Fencing Academy offers introductory packages, private lessons, group classes, after-school programs, membership benefits, parties, day camps, and summer épée camps. Mokretsov explained many high schools around the area including Great Neck North and South, Manhasset and Jericho offer fencing for students, and he hopes students will be able to use the new facility for training as well. Many may think that because fencing utilizes weapons, or épées, it could be harmful; however, Mokretsov explained that it is one of the safest sports because the equipment is made so that students cannot obtain weapon-related injuries. Another safe factor of fencing is that it is not a contact sport. While fencing offers physical benefits like improving strength, coordination and agility, Mokretsov also explained that there are many mental benefits to fencing. New York Fencing Academy is located at 8 Haven Ave., Suite LL3, Port Washington and is open Monday through Friday from 4 to 9 p.m., Saturday 9 a.m. to 6 p.m. and Sunday 9 a.m. to 6 p.m. by appointment. For more information about New York Fencing Academy, visit www.fencenyfa.com.